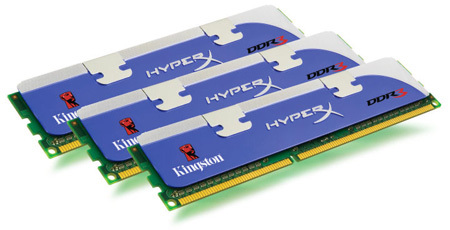 If Corsair's tri-channel DOMINATOR memory is ultra quick, then Kingston Technology's 2GHz HyperX solution has to be labelled as super-duper quick. In preparation for Intel's impending Core i7 launch, the California-based memory specialist has announced an entire range of tri-channel solutions designed for X58 motherboards and raised the performance bar to 2,000MHz. Kingston's 3GB HyperX DDR3 2GHz memory - priced at around £205 - supports Intel's XMP (Extreme Memory Profile) and meets Core i7's 1.65 voltage recommendation. It does it, however, in a 3GB kit consisting of three 1GB modules, there's no 6GB offering at 2GHz yet. The quickest 6GB kit as far as we're aware is Corsair's 1,866MHz solution. Aside from the high-end gamer-orientated 2GHz kit, Kingston has a whole range of tri-channel solutions that cater for a wide range of users - including a 3GB ValueRAM kit at £80.43, that could be the cheapest tri-channel we've seen thus far. What do we think of the price? Not sure about the high-end stuff, guess if you're shelling out over a thousand for a system it's worth considering. I was more interested in the mainstream - 6GB DDR3 1333 @ £147? Thanks very much. But why is the slower speed 1066 the same price as the 1333? Do tighter latencies matter that much? Anyway, more RAM, up to a point, is more important than faster RAM, so I can't see that many people opting for 3GB kits that cost more than the value 6GB kits..